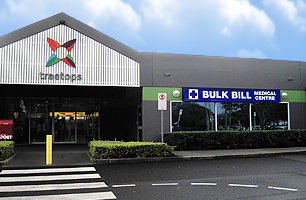 Treetops General Practice is a bulk billing medical centre in the heart of Burleigh Waters on the Gold Coast. Our seven GPs provide friendly, family oriented, thorough and advanced medical care to all our patients. With years of experience in the broad range of health problems affecting all age groups and family members, you will appreciate the care and attention you receive from the doctors here at Treetops. For your convenience, we also have three experienced nurses who also manage our chronic disease appointments. Podiatry, Physiotherapy, Pathology, Optometrist, Breast Screen, Radiologist and Hearing Services are all located within an easy stroll of the Practice. We offer consultation with or without appointment, and look forward to welcoming you to our Burleigh Waters general practice. For your convenience all Medicare rebateable appointments will be Bulk Billed for full Medicare card holders (green cards). Please ensure your Medicare card expiry date is current (bottom right hand side of your card). If you have a reciprocal agreement Medicare card (a blue or yellow card) you will be required to pay the Medicare rebate and claim the full amount back from Medicare. Whilst most general consultations are covered by Medicare, If you are unsure please call our receptionists who will clarify this for you in advance. Please make sure that you notify the practice of any changes to your address or contact details. Reception are happy to assist you. To aspire to excellence that comes from doing more than expected. AUSTRALIA HAS THE HIGHEST INCIDENCE OF SKIN CANCER IN THE WORLD! Early detection and treatment increases the cure rates for melanoma and other types of skin cancer. All our doctors Bulk Bill for your dedicated skin check. Make your appointment now. TREETOPS GENERAL PRACTICE HEALTH CHECKS! Did you know you may be eligible for a Government funded health check? Target groups of eligible patients are regularly invited to participate. Either your doctor or our team of nurses can discuss and book this with you. This is a good opportunity to develop a health plan that may include additional Government resources or further relevant investigations. Our team use dedicated appointment times to address all your questions and to ensure we work with you to achieve the best possible results. All our doctors make visits to our regular patients when it is safe and reasonable to do so. These may be visits to patients in their homes or to residential care facilities, during or after practice hours where the patient is acutely ill, immobile and elderly, or has no means of transport. Visits are usually offered at lunch times or after hours and are arranged at the discretion of your treating doctor usually to patients living within a 5 kilometre distance of the practice. If the patient is located too far away for a home visit, the practice will ensure there is an alternative system of care accessible to them. Our doctors do not take phone calls from patients during consultations. All messages will be directed via Reception who will pass them onto your doctor at a convenient time. All our staff are trained to identify urgent medical situations and during busy times you will be asked if your call is urgent before placing you on hold. To further address this issue we may transfer your calls to our dedicated nursing staff who will triage your concern appropriately. Parking: Plenty of parking available including disabled around Treetops Plaza.